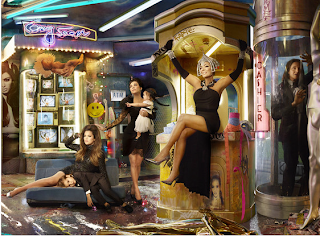 There are some glaring omissions on this year's Kardashian Family Christmas Card. The Kardashian-Jenner family released their annual Christmas card during last night’s special episode of Keeping Up With the Kardashians: a Very Merry Christmas and this year’s greeting was no let down. While it doesn’t exactly scream “seasons greetings,” the high-fashion photo is striking. Shot by photographer David LaChapelle, the picture displays members of the famous family strewn about in a carnival-like room filled with neon lights, dollar bills, and gold mannequins. With all the Kardashian-Jenners dressed in black, Kim Kardashian looks sultry striking a pose on a staircase while Khloe lounges on a chair with Kourtney’s son Mason. Kourtney stands nearby, holding her daughter Penelope. Kendall and Kylie Jenner look all grown up as they both pose in floor-length black gowns with slits up to their thighs. Matriarch Kris Jenner is featured front and center, throwing her hands into the air and showing off her legs while Bruce Jenner is behind her in a glass case. Noticeably absent, however, were the men of the family other than Bruce. Rob Kardashian, Kourtney’s boyfriend Scott Disick, Khloe’s husband Lamar Odom, and Kim’s fiance Kanye West were all missing from the photo. Also missing was Kim’s 5-month-old baby, North West. Bruce should have passed on this too, after they ratted him out a cross dressing freak. I know why North and Kanye weren't there because he problem had a queen fit that they would not let him direct the photoshoot and give the concept, so he said he and North ain't doing it. what a bunch of assclowns!!!!!! this picture makes me sad!!!!!! i wish they would go away!!!!!! the picture ths year its really ugly i must say!! and Bruce really I think he enjoys been the joke of the Kardashians!! The succubus finally devoured their prey!! !